Martin, looking at ease, whilst trying out Derby Velodrome before it's official opening.. Future track cyclist? 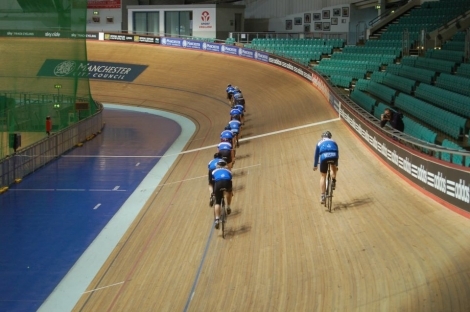 The club usually manages to arrange one or two visits to the Manchester velodrome each year. These sessions are normally two hours long, a fully qualified coach is provided who will take complete beginners thgough the basics (and remind the more experienced riders). 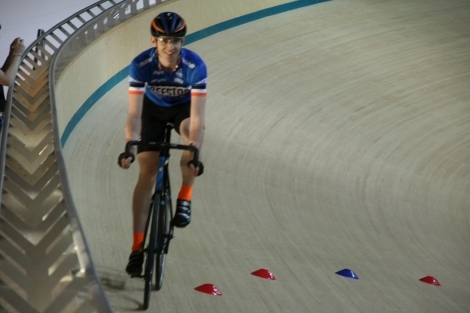 During a visit to the Manchester velodrome the coach will take us through the basics of riding a fixed gear track bike and begin to teach the skills needed to safely and confidently join the track, ride on the banking and how to safely leave the track (and get off without falling over). Soon we're all riding on the blue 'stayers-line' at a recovery pace, with each rider taking a turn on the front and then dropping to the back of the line to rest and recover. The blue-train on the stayers line, Matt moving expertly to the back of the line having just done his turn at the front. Next come some more skills and some short sprint efforts, 'taking half laps' and such like. Later there is normally some sort of 'mock racing', in the past we've done individual 'flying laps', a team pursuit and an Italian sprint. At the end of the session there is time to do some unstructured riding, take some pictures and soak up the atmosphere. Beeston CC from Dan Williams on Vimeo. 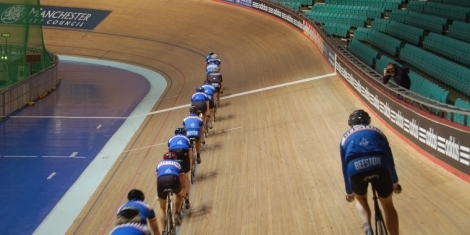 Some club members have taken their track cycling further, there is a formal progression pathway which takes place after a taster session. Riders who want to move through the process need to ask to be assessed for a 'Blue Slip' at the start of a session, the coach will then keep an eye on you during the session and may ask you to do certain extra things. To safely and easily ride in a line of at least four riders on the Stayers-Line for 20 minutes at recovery pace. Be able to change from the front of the line to the back cleanly and confidently, after looking to make sure it's clear. Four solo laps of the track at the top of the banking. Leading the recovery line and changing to the back of the line every lap and every half-lap. Joining and leaving the track as a single group of 16 riders. Riding in two paralel lines and changing to the back of the line whilst still riding 2-abrest. Riding round the blue safety zone (the dark blue flat area inside the light blue côte d'azure) in pairs, leaning on your partner. Holding hands with your partner and performing a madison style pull through. Riding a slalom up and down the banking around a series of cones. It's normal to need to go to several of these sessions to learn all the different skills needed before gaining a 'pink-slip' and progressing to the 'Skills Session'. The 'Skills Session' is a dry run for the accreditation test, some final skills are introduced (including the dreaded 'lumps and bumps' and 'the square dance') and brought together with all the skills learned so far into a continuous 35 minute block. There is then some sort of 'efforts' such as 'taking half laps' which was learnt on the initial club taster session. Once the skills session is passed a final 'green-slip' is issued and you move on to the final Accreditation session. The two hour accreditation session involves riding the same set of skills practiced in the 'skills session', then a period taking half laps and then a first taste of track racing, such as an 18 lap scratch race. Finally (if there is time) there is an introduction to riding behind the Derney! A new £22 million multi-sports arena is currently being built in Derby, the arena will include 10-12 multi use courts and a 250m indoor velodrome track. 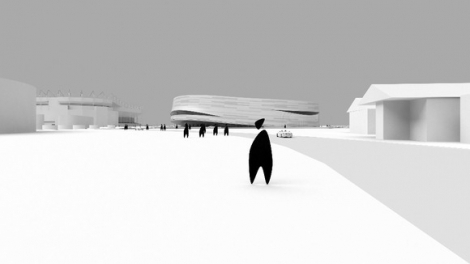 When completed it will be the sixth indoor velodrome in the UK and may be open slightly before the 2012 London Olympic Velodrome! Work started in November 2012 and construction is due to be completed in autumn 2014. Or follow @DerbyVelodrome on twitter for infrequent updates.